I’m from Texas and awhile back (as in a depressingly I-feel-so-old while back), the state hired a marketing agency to help with combatting littering. The agency decided that Texans were a bit of an ornery bunch and “Please don’t litter” wouldn’t resonate. So they came up with “Don’t Mess with Texas”. And it was a success. Most Texans threw beer bottles from their car window less than half as often as before. 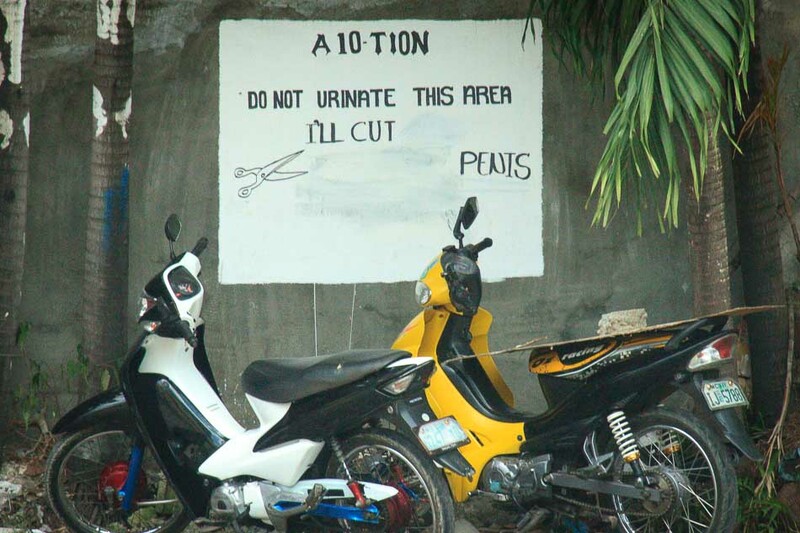 But that didn’t prepare me for this sign in Bohol, Philippines. I may litter but I’ll be damned if I’m going to pee there. Funny. And I love how some of those non-Austin Texans seem to have forgotten that the expression was not created for chest-beating cretins as a rallying cry in a bar brawl, but rather an admonishment, in a way, for them being complete pigs. that’s crazy! I would definetely be scared and not pee there, even though I don’t pee outside. Wondering, though, why so many people would have chosen that spot to pee?? HAHAHA that picture just made my day. I’m definitely going to use that threat on signs I make in the future. The spelling of attention also gets points. You do have to appreciate something so simple and to the point! I think I will only use proper facilities when visiting. Marcello Arrambide recently posted..Is Day Trading & Traveling Really Possible? Great shot. I gotta wonder if that spot is female-friendly though. That’s probably one of the most effective ad messages I’ve seen in years! SHINK! Ouch. Another thing not to do in the Philippines. Did he realise the drawing was too shocking before he erased it ;-) !!! I guess this guy was really pissed off. I’m *dying* to know what he erased! Yes, I would also like to know what else was there, as if what is showing is not bad enough. Thanks for sharing! MACH recently posted..Do You Want Free Airline Tickets? This is funny! I am from Philippines and its commonly written in tagalog that’s really funny but its funnier that they wrote it in English even in a bad grammar. Still shows Filipino humor.